It's needs a 3x6x2 template. The scale is not bad at all. See the building in action.. Even though it is most likely original size, I would suggest to shorten it a bit to fit it more into simutrans world. Ideally I would get 2x2 size, then it could replace the old kathedral. What do you need to change something? I used Google Translate ! Second rotation would be great; otherwise this will forbid map rotation ... Should not too difficult with 3D modells though. Now, comparing the whole, I think the small one fits better. a 2x2 size, as prissi suggested, would seem very small imho, but you can make the test. Btw, there're some white zones near the borders that should be removed for the final release. I like the small version better, too. Very nice! Next step, add the colors of night and winter version! Well done!! It's going to be a great addon..
DO not misunderstood me. The one on the previous page is very beatiful. However, a replacement for the current 2x2 cathedral is alsodesired. That was, why I suggested also a little shortening for a standard cathedral replacement. This is rather pak comic I suppose? What is the deal on using these google sketchup files for simutrans pak releases? Do we need to get permissions or are they already open-source by being released up there for download? That was already discussed here and the conclusion we got was..
[..] technically, the creator retains copyright, but anyone could freely use anything uploaded for Simutrans. I think I'll have to add something on the background because at some climates it's difficult to distinguish the fossil..
A new WIP of Archaeological sites, the release is very close.. I think the big one is far more realistic in terms of scale. Those mediaeval cathedrals are huge. EDIT: it's the tower blocks that are too small, in fact. The Archaeological sites attraction is finished and ready for downloading. where can I download it vilvoh? The original one will come at the end of this month. Finally, I've finished the Big Ear. I added an extra antena, several trees and bushes, and the fence. Its chance is low, so probably it won't appear often, one or two by map as much. The intro date is 1951. Can you create a version for pak128? I may try it, but I don't know if it will be detailed enough for pak128 standard. I'll upload the sources to graphics.simutrans.com in a few days. Btw, Prissi told me that perhaps it will be included in the next pak64 release..
As always, the graphic sources for pak64 scale are available at graphics.simutrans.com >> vilvoh's gallery (link). If you want I can send you the dat file. As always, the graphic sources for pak64 scale are available at graphics.simutrans.com >> vilvoh's gallery (link). Here it is. The Gigantor monument. It appears in cities with more than 3500 citizens. 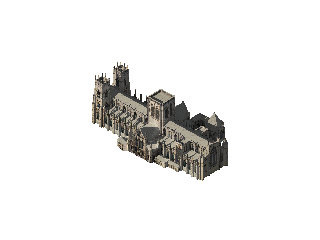 Finally, I think I've found a good set of textures for the cathedral. Now, I just need to add some trees and a fence. 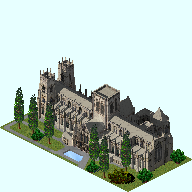 Here you have a preview, with a comparison between the old cathedral and the new one.